Flora Samson, Ts'peten Defender, with granddaughter Kanahus. Ishkadi receives the mic from Hotseta. Both men told of the significance of Wolverine's visit to their Tahltan territories. Matthew Danes, Gitga'at, speaking about his months at Lelu Island / Flora Banks, escorting LNG reps out of the territory. This fax is a request from BC's Attorney General for more sniper rifles from the Canadian Armed Forces. He clarifies the RCMP will use them against the Ts'peten Defenders. Over a hundred people gathered during the afternoon of September 11, 2016, to remember what happened at Ts’peten (“Gustafsen Lake”) on that date in 1995. On that date, more than a dozen Secwepemc sovereigntists were trapped inside a barricade of 400 Royal Canadian Mounted Police – cut off from roads, radio and satellite phone – at the site of their recent Sundance. A formal inquiry has been demanded ever since. Last Sunday, there was solidarity with Secwepemc sovereigntists from Flora Banks to Miqmaq to Treaty 8 caravanistas in Quebec. 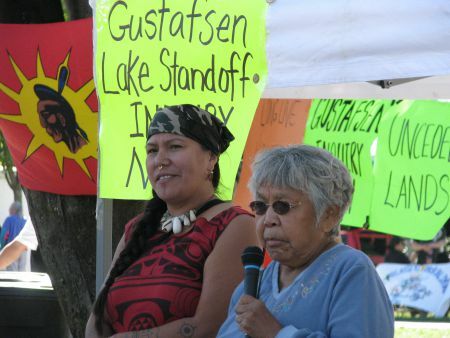 And each of the dozen speakers at the event had been profoundly impacted by the stand-off at Gustafsen Lake. “For guys like Wolverine, who set the stage for resistance; what he did was so significant for me that I went home and carried on the resistance. I was a student during the standoff in 1995, but Wolverine was my hero. I had the honour of meeting him two years ago. We took on the second biggest corporation in the world: Imperial Dutch Shell. We took them on, and we saved the Skeena, the Nass and the Stikine Rivers in our territory.” - Hotseta, Tahltan. Perhaps the most remarkable thing that happened on 9/11 ‘95 was the state’s use of banned C-4 landmines, and two Armoured Personnel Carriers, to utterly destroy an occupied vehicle making an authorized trip to collect drinking water. Perhaps it was the 77,000 rounds of ammunition that 400 RCMP fired into the Sundancers’ camp in their unceded, unsurrendered sacred site. Or perhaps the fact that no one was killed? But some remember best how Wolverine, a Secwepemc political leader aged 65 years, disabled an APC with one shot to the steering column, when that tank – which was chasing him through a forest – exposed its undercarriage while rolling over a pine tree. “Wolverine had a very deep knowledge of the legal parameters of what it means to be Indigenous in this land. When we self-identify as “Indigenous,” “First Nations,” “Aboriginal,” “Metis,” “Indians” - right away we are complicit within a framework of contractual language of colonization. So when these cops talk to you, talk to them in your language. How your grandmothers are connected to your land – that is your true paperwork here.” – Ronnie Dean Harris, Sto:lo, St’át’imc, Nlaka’pamux, Kwikwitlem. Wolverine died earlier this year. He penned a formal request for a national inquiry into the events at Gustafsen Lake in 1995 shortly before he passed on to the spirit world. He had been requesting an inquiry since his incarceration for “attempted murder” – meaning his attack on the APC – after the BC court trial proved to be heavily biased in favour of British Columbia. “I was sixteen when I got my first fishing charge, going to get a fish for my grandmother. She asked me to get a fish, so I went and got one. I have a couple hundred fishing charges now.” – Rick Quipp, Sto:lo. The people who gathered in Grandview Park, Vancouver, last Sunday – from all corners of occupied British Columbia – demand a formal inquiry into the attempted assassination of those Secwepemc political and spiritual leaders, and their supporters who wouldn’t leave the camp even under threat. And they remember their war heroes. “My hands are raised especially to the women who go out there and put themselves in harm’s way. They don’t just make the points, they make the changes. On this 21st year, marking the day when 77,000 rounds of live ammunition were fired on Indigenous leaders in ceremony, on sacred lands. …Each of you, keep doing that work. Hold that line, wherever you are. Whatever you can do to get the truth out there: not just to dispel the mis-truths, but to get the truths out there. We need every one of you and we need everyone that you know, because we are in the midst of a battle. * More speakers on the Ts’peten Defenders’ importance for Indigenous resistance to British Columbia follow below. There was probably no need for war heroes; Canada and British Columbia created them. In January of 1995, Secwepemc traditional leadership had launched a legal action to get an appropriate judicial hearing of their complaints against the state. Their complaints were 150 years old at that time, and they were continuing to seek a lawful resolution to Canada’s occupation and assumption of jurisdiction over their territory. The Attorney General of BC stonewalled the January 1995 legal application, which was destined for the Governor General of Canada, contrary to his duty as a colonial legal representative for the Province. The Attorney General’s office is the only address available to Indigenous complaints against the state, and then a complaint must be forwarded to the Governor General in order to arrive at the appropriate court. Instead of processing the complaint, the province and its RCMP staged events which would escalate a confrontation on the ground. It is these staged events which resulted in a police and military siege on a spiritual camp in unceded lands. More than events, the RCMP then commandeered all functioning media outlets to report its dictations about what was happening during the siege. The branding of the land defenders as "terrorists," "thugs," "doomsday fanatics" and more seemed to create an acceptance in the BC public that the "green light to shoot to kill" was justified. The siege did not accomplish its apparent goal of assassinating the Secwepemc leaders, but then a BC Supreme Court trial of the surrendering Ts’peten Defenders detained them in the proceedings of the longest criminal trial in Canadian history. And then in prison. Why did BC choose military confrontation over legal arbitration? This is the central question to a formal inquiry into events at Ts’peten in 1995. And the suspected answer to that question is: British Columbia knew then, as it knows now, that the colonial regime can never win a legal challenge to its assumption of jurisdiction in Indian territories which have never been sold, ceded or surrendered to the crown. British Columbia chose assassination of the legal advocates over entering a defined process to a legal resolution. “Now, for us to protect a scared site, as a Sundance Ground, all the occupants at Ts’peten were Sundance Family. We heard that cattle were desecrating our sacred site. When we erected a fence to keep the cattle out, that’s when the altercation started. It was like the wild, wild west. They had the cattlemen come out and intimidate the women, children and Elders at our camp. They had no actual deed to the land. - What are the merits of the Ts’peten Defenders’ legal position that the land they were occupying does belong outright to the Sewepemc, and that the RCMP does not have a right to enter that territory without invitation, and that a British Columbia court does not have jurisdiction to hear a land-based jurisdictional dispute between British Columbia and the Secwepemc? In what international court can that question be heard? - Why did the Attorney General of British Columbia not forward the Secwepemc petition to the Governor General in January of 1995? That action is one of an Attorney General’s prescribed duties. Did that political and legal stonewall predicate confrontation on the ground, instead of in a court room? Was that alternative desired by BC? 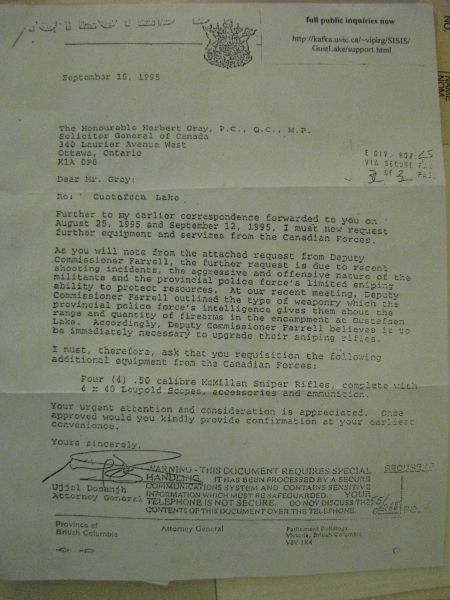 - What was the purpose of the RCMP’s several meetings with the cattle rancher Lyle James (who had a provincial license to range his cattle in the area of Gustafsen Lake) late in 1994 and early in 1995, and their interference in his relations with the Sundance leaders, their persuading him not to attend a preliminary meeting with the Sundance leaders, as he had for the previous three years? - Why were none of the criminal actions of the rancher’s cowboys, violent actions against the Sundancers in June and July, investigated by RCMP at the time? Did those assaults against the Sundancers escalate the prospect of confrontation between the rancher and the Sundancers, putting the latter into a self-defense posture unprotected by the RCMP? - When Superintendent Len Olfert admitted in his testimony at trial that the RCMP had been planning for this police and military event since April 1995, even though no shots were fired until August, what was he talking about? This oddity was not investigated further at trial. - Why was the Aboriginal RCMP Constable Wilson removed from his role as liaison with the campers and replaced by Mike Webster and “Camp Zulu,” when Constable Wilson had repeatedly reported the Ts’peten Defenders’ desire for a peaceful discussion? And why was he never involved in mediations again? - Who requested the use of internationally banned landmines against the Ts’peten Defenders, and why? Who authorized that usage, and who supplied the C-4 explosives? What are the repercussions for such illegal usage? - Who authorized the internationally repugnant use of military action against citizens? Why? Who supplied the Canadian Armed Forces to the RCMP’s command? Why? What are the repercussion for such illegal action? - What events surrounded all news media editors’ cooperation, allowing the RCMP to dictate the content of their reporting during the stand-off? And what or who informed the RCMP’s actions in that regard? And how did the RCMP decide exactly what to dictate to the media on a day-to-day basis, and what was their purpose for the content they supplied? And was the media’s resulting extremely biased coverage criminally defamatory, or inciting to hatred? - On what grounds did the trial judge refuse the jury to consider Wolverine’s lawyer’s testimony? The exemption was stated as a reason for the jury’s finding of guilt in the Ts’peten Defenders. Was the judge’s refusal legal? - How is it that none of these unprecedented, incredible events have ever been reviewed by any government or civil body? - What was the cost of that military operation? The trial? The extensive surveillance of the Sundancers long before shots were fired and throughout the stand-off? The activities of RCMP who were meeting with the rancher from 1994 up until and possibly during the stand-off? “Weytk. I feel happy that we’re standing strong together. I pray every day for all the workers and supporters. I thank my granddaughters for helping me through difficult times. My husband left us in March. “I met Wolverine in 1974, when we were growing gardens in our community. 1974 was our first stand-off, in Cache Creek. We tried to have better housing for our native people, because we lived in very, very poor housing, where there was no running water, no power. Instead, they gave us these great big houses that we have to pay for now. But ever since then we have been supporting people in their struggles for good water, for the fish, for our burial grounds. Now it’s the mining that’s going through our countries. I pray for the people in South Dakota now who are trying to protect their land. (applause) My family just returned from there. Ever since I’ve known my husband, he was a hard worker. He liked to help the people; to provide for his family and community. We grew big gardens. Later on, we started helping the people who were standing up for their rights. We sent food to them. Wolverine said, “You can’t fight when you don’t have food,” so he started planting big gardens. I thank all the people that came to help, weeding and planting and harvesting in the garden. I thank all the people who are standing up for their rights. Wolverine always said, “Never give up. Never give up or these small children; if you give up they will have nothing. They will be walking down the road with little packsacks on their back; they will have nothing. Now I see his grandchildren speaking up, standing strong, listening to his words. When we were in Gustafsen Lake, I was on my way up there to bring food to the people up there. I was busy at home canning, and the boys were helping me at home. My son was there. So I brought the food up to Gustafsen Lake, and I was going to come right back and do my canning. But that night they closed the road, nobody could go out, and I was stuck in the camp – me and my two children and grand-children. From then on we couldn’t get out of the camp. Planes and helicopters were flying around, army tanks were surrounding us. They were putting land mines all around us. Every once in awhile we would hear them going off, when the cows would step on them. We didn’t feel any fear. We were happy. We did our ceremonies, we were happy, we sang our songs, we told our stories. But they kept tightening our surroundings so we weren’t able to get water. So these two went on the truck to get water from the creek. That’s when their truck was blown up by land mines. Only the dog was killed. On the last day, on the 10th, they sent some Elders in to see if we wanted to go out, but nobody wanted to leave. Only two people left at that time, but we all stayed. But the next day our Medicine Man came and he told us we should go. So the four Elders were the last to leave. Everyone else left before us. We were going down the dirt road, and we turned off, and I said, “Oh no!” We could see cops and army people and guns pointing at us from all over the place, even the trees. There were a bunch of dogs. They were all armed and had their shields on. I said, “Is this where they’re going to kill us?” We didn’t know what had happened to the rest of our people who went out ahead of us. I thought they were probably all dead. But they were all there. They were getting handcuffed, and pictures taken. We were the last ones to go out. It was really sad to leave that place. But that’s where they took us to jail. And Wolverine was the one that got the most time – eight years. When we were up there, we felt at peace; we weren’t afraid. We all laughed and joked around, sang songs and drummed and prayed. We had to ration our food. Last year when we were on our way to Gustafsen Lake for the anniversary, when we started getting close I started shaking. I wanted to see the place. But I got okay when I got there, walking around, looking at the place. But I could picture everything that went on. All the trees that got shot, they were all cut down. I guess they were cutting down the evidence that was caught in the trees. “From our territory to your territory, our hearts are here. Kukwtsam. I would like to speak on the work my grandfather has done over the last 30 years. My grandfather launched an inquiry into Gusafsen Lake. What does that mean to Canada? We have human rights violations going on here. Now, for us to protect a scared site, as a Sundance Ground, all the occupants at Ts’peten were Sundance Family. We heard that cattle were desecrating our sacred site. When we erected a fence to keep the cattle out, that’s when the altercation started. It was like the wild, wild west. They had the cattlemen come out and intimidate the women, children and Elders at our camp. They had no actual deed to the land. A lot of people came out to support us: from Haida Gwaii; Haudenosaunee, people came far from down south to honour us as true owners of the territory. The RCMP moved very quickly – they didn’t issue any kind of “Jane Doe” or John Doe” injunction – they just surrounded us. Just as they’re doing in South Dakota right now. “Our struggle has not ended. We are now finally reaching the point where we are beginning to be heard, and we have gained some ground. The courts are beginning to recognize the fact that they have a legal obligation to deal with us and our rights; that they have to get our permission before they proceed with their own plans for our lands. “If you do nothing to stop the genocide, you are complicit. We blockaded Imperial Metals, and we were charged. Anyway, it was an honour for me to meet Wolverine. I was a student during the standoff in 1995, but Wolverine was my hero. I had the honour of meeting him two years ago. I went home about ten years ago. There was a lot of industry on our territories; a lot of threat of industrial disaster. We took on the second biggest corporation in the world: Imperial Dutch Shell. We too them on, in the process, we saved the Skeena, the Nass and the Stikine Rivers in our territory. They all come from one spot in our territory. Dutch Shell was going to do fracking in those headwaters, but we stopped them. Another company tried to do the same, but we stopped them also. For guys like Wolverine, who set the stage for resistance; what he did was so significant for me that I went home and carried on the resistance. Right now, there is serious hunting by foreigners going into our territories. They refer to our territory as “no limit entry.” We do a lot of work in that regard as well. I spent a lot of my life under colonial laws, thinking that I’m not native. It took me awhile to regain my sense of self and to learn my language and my culture. People like Wolverine, of mythical status, when they showed support at our stand against RedChris in 2014. I come from a lot of dissent, protest and activism in my bloodline. We gather here today to commemorate a very important standoff that has been erased, buried in the Canadian history by the corporate media, by the education system, and by the policing systems, and by narrative that goes to everything that being Canadian is – which is, un-indigenous. Wolverine had a very deep knowledge of the legal parameters of what it means to be Indigenous in this land. Unceded territories, a lack of treaties …and women standing up; mothers leaving their homes to stand up against the corporate state of Canada, USA and oil giants. When we self-identify as “Indigenous,” “First Nations,” “Aboriginal,” “Metis,” “Indians” - right away we are complicit within a framework of contractual language of colonization. So when these cops talk to you, talk to them in your language. Tell them how your grandmother was connected to this land, in your language. That connects you to your sovereignty, and that gets you out of the framework agreements of colonization. We’re looking at a colonial corporate state, governed by a figurehead – the queen: it means nothing. How your grandmothers are connected to your land – that is your true paperwork here. The problem is we’ve been born into colonization. We’ve been used to asking, we’ve been used to fighting for it, trying to get it. But the problem with that is – that sovereignty already exists now. Tomorrow we will be marching in solidarity with standing Rock, South Dakota. We’re asking everyone with a TD bank account to close it. Justice in Paradise, by Bruce Clark. Book, 2004, by Wolverine’s lawyer. Gustafsen Lake: Under Siege Exposing the Truth behind the Gustafsen Lake Stand-Off, by Janice Switlo. Book, 1997, by a lawyer who briefly represented Wolverine at trial in 1996. From Attica to Gustafsen Lake, by Dacajweweiah “Splitting the Sky” John Boncore Hill and Sandra Bruderer. Book, 2001, with extensive documentation of events and correspondence from the time of the standoff. On the morning of September 11, 1995, a circle of 400 Royal Canadian Mounted Police constricted the camp of the Ts’peten. 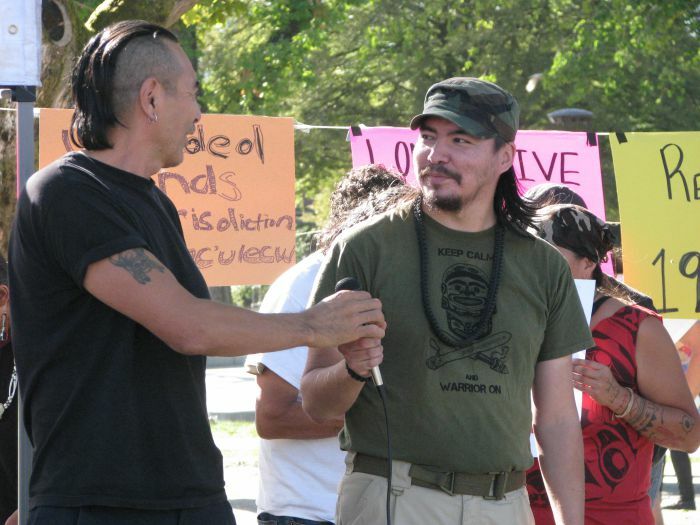 The spiritual and political leaders of Secwepemc, who had launched a legal action against Canada for its unilateral, military assumption of jurisdiction over Secwepemc homelands and Secwepemc people, were cut off from the world by the police barricade. They were camping at the sacred site of their most recent Sundance ceremony, and refused to leave – even after being provoked, threatened and assaulted by a local rancher who was in consultations with the RCMP. The Sundancers, spiritual leaders, chiefs and their families were now cut off by the RCMP line from their water supply as well. 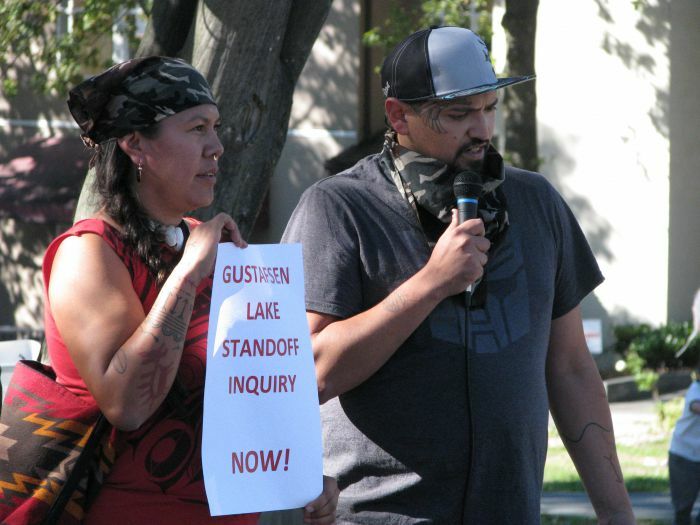 So, on that morning, they sent two people out in a red truck along a predetermined course to fetch water, as agreed by CB radio with the command centre of “Operation Zulu” – the RCMP’s name for their siege at Gustafsen Lake (Ts’peten, to the Secwepemc people). As the water carriers proceeded to the water supply, along that predetermined course, the RCMP detonated a C-4 landmine under that red truck, then rammed the truck from the front with an APC and then rammed the truck from behind with another tank, and then opened fire on the two occupants of the truck who fled and were – miraculously – not harmed by the explosives or tanks. They ran from the explosion back towards camp, with their arms raised above their heads to show empty hands. One of the two was hit by a bullet to her bicep, which was at that moment only inches from her head. The bullet was fired from a high caliber sniper rifle. Then the Armoured Personnel Carriers pursued the two through a forest of pine trees, driving over the trees as if they were nothing but weeds. And then the 400 cops let loose a hail of bullets over the camp. They let loose a hail of 77,000 rounds. But the explosion had triggered action by a wary Wolverine. Wolverine, aka William Jones Ignace, age 65, Secwepemc political, community and family leader, set off towards the explosion with a hunting rifle. He ran towards the APC as OJ Pitawankwat and Suneva Bronson ran away from it, and they eventually swam across the lake back to camp. Wolverine intended to cover the two people escaping, and stop the two APCs from approaching the camp - they were firing as they proceeded. One of the APCs was grounded on a tree stump. The second APC began pursuing Wolverine. Finally the tank’s front end was raised up as the machine drove over a tree, and Wolverine shot out its steering mechanism under the front end. That target was about the size of a 25 cent piece. Canada is, and was at the time, a state signator to an international convention which prohibits the use of C-4 plastic explosives, which are detonated by remote control. Canada is, and was at the time, also a signator to international conventions which forbid military assault by a state government on a state’s own population. Interestingly, in a legal reality which Canada and British Columbia did all this to obscure, Secwepemc people are not actually, not consensually, citizens of Canada. Canada has actually unilaterally imposed Canadian citizenship on all Indigenous people, as of 1951.